Don't let something little turn into something huge! Don't Wait to Fix a Small Leak! Winter storms can seem never-ending when they are still occurring in March! If you have been holding your breath all winter thinking maybe the roof will last, or you’ll be lucky that the wall without proper insulation doesn’t end up with a broken pipe, or that the small leak in the hot water heater won’t turn into the bottom falling out, you have been living on borrowed time. Don’t gamble with your safety or the possibility of large-scale destruction happening to your home. Take immediate action before a small fix, turns into a huge fix! Not only are hug fixes more disruptive and damaging, they are more time consumer and expensive as well. So before something small turns into a big nightmare, Call SERVPRO of Fair Oaks-Centreville-Chantilly today on (703) 830-5800 and we’ll be happy to help you out. First rate response time and unparalleled professional service is why residents of Northern Virginia choose SERVPRO of Fair Oaks-Centreville-Chantilly. With a highly trained, licensed, and certified staff of remediation specialists with over 50 years of collective experience in the field, an extensive fleet of recent model trucks, vans, SUV’s, and cars, and a 7,000 square foot warehouse brimming with the newest and best remediation equipment and materials, SERVPRO of Fair Oaks-Centreville-Chantilly is there to serve your every need. Being educated, equipped, and at the ready, is why we are one of the nations’ premier remediation specialist. So, if you need help following a fire, or discover mold infestation in your home, call SERVPRO. Should a storm get the better of your basement and you find yourself standing in water….call SERVPRO! And don’t stress about moving your belongings while remediation and restoration takes place, SERVPRO will work with you to inventory, pack and store your belongings. We really are a full-service operation! Contact SERVPRO of Fair Oaks-Centerville-Chantilly on (703) 830-5800. We’re available 24/7. 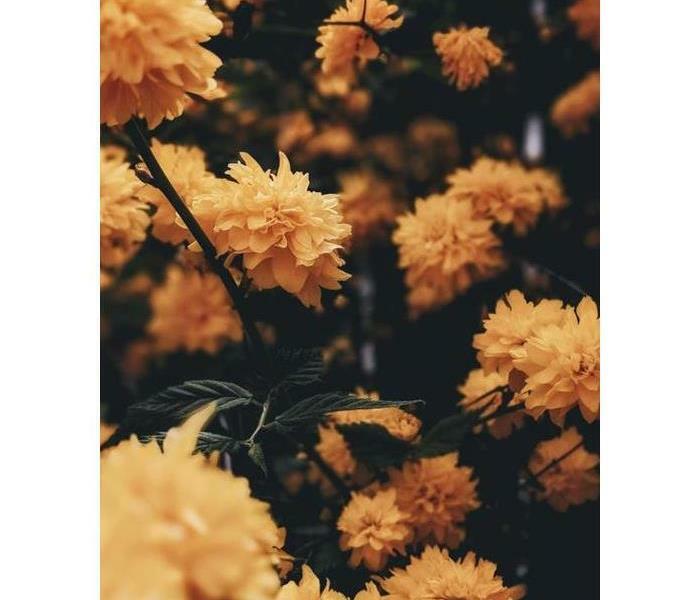 Go On....Go Smell The Flowers! Do not ruin your weekend trying to be the DIY Warrior. Enjoy your free time with friends and family. Take a drive in the country and enjoy the wildflowers. Call SERVPRO for all your remediation needs. Whether it’s the clean-up after a storm, water from an over flowing washer, mold in your attic, or a bio-hazard cleaning job that needs immediate attention, SERVPRO is there to do the job . We’ll do it right the first time and leave your home or office “Like it never even happened.” So, go smell the flowers and hang up your DIY tool belt and let the professionals at SERVPRO tackle your issues. No job is too large or too small, so don’t hesitate to call. We can be reached 24/7 on (703) 830-5800. Water issues got you down? 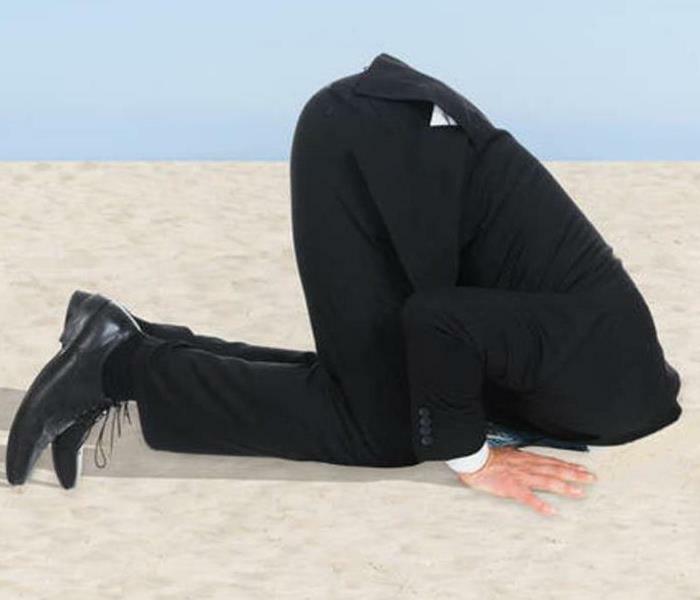 Don’t stick your head in the sand…….Why not call SERVPRO. Is it water damage you are avoiding taking care of, or, is it mold that has crept into those dark, damp spaces? Whatever the issue, simply call SERVPRO of Fair Oaks-Centreville-Chantilly and we’ll be there to help. Don’t let the unknown freeze you in your tracks and prolong your procrastination. And why take on a task that is well beyond the weekend DIY project? Call in the professionals at SERVPRO to assess your needs, determine a game plan, and execute your remediation. Why SERVPRO? Because we’re the best and we’re there to guide you through the process from start to finish. So, stop worrying and pull your head out of the sand and call us today on (703) 830-5800. When you don’t know where to turn, call SERVPRO. We are experienced in deep cleaning, biohazard cleaning, mold remediation, water and fire restoration, and we also pack and box household item for storage and a host of other home and business maintenance and repair services. We understand that sometimes a job is too big to tackle alone, and it seems insurmountable. 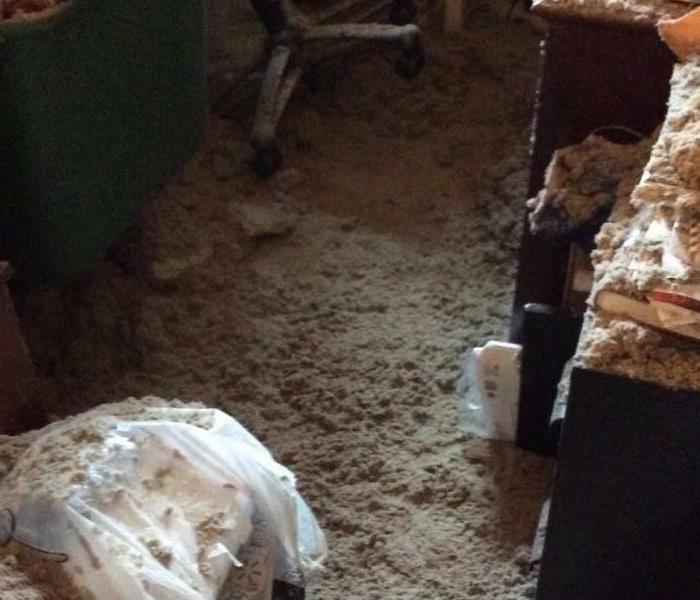 That is why you should call SERVPRO today. We can determine a plan with you, then execute to get you back on track. We understand that a person’s house is their home and we will treat you and your belongings with the utmost care and respect. Let us help you today with your deep cleaning needs. So why not call SERVPRO of Fair Oaks-Centreville-Chantilly today on (703) 830-5800. It’s winter and in the Mid-Atlantic region of the country, it is grey and wet! Without much sunshine, it can start to feel even more dreary than it looks outside. During these rather bleak months, the infestation of mold can take hold within your home. Be proactive and take a good look around. 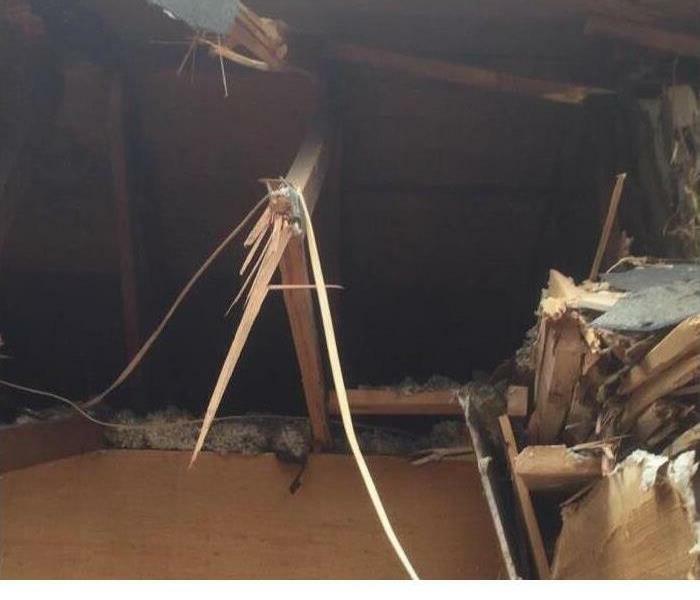 Check your attic when putting away the holiday decorations. Same goes for the basement, when you’re down there doing the winter purge of too many “things” around the house. Check bathrooms, laundry rooms, underneath kitchen sinks, wet bars, hose bibs, anywhere that water could possibly leak. Also, don’t forget to check downspouts, gutters, chimney seams, door frames for good tight seals. 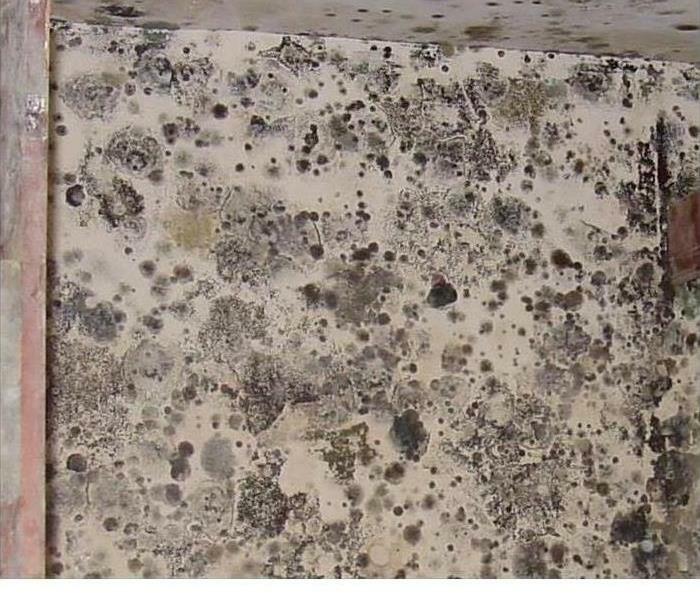 Should you detect mold, or see the tell-tale signs of water, call in the professionals at SERVPRO. SERVPRO of Fair-Oaks-Centreville-Chantilly can be reached 24/7 on (703) 830-5800. We’ll send a team of highly trained professionals to assess your needs and take care of your mold related issues. So don’t let the cold, grey, weather…..and mold, get you down. 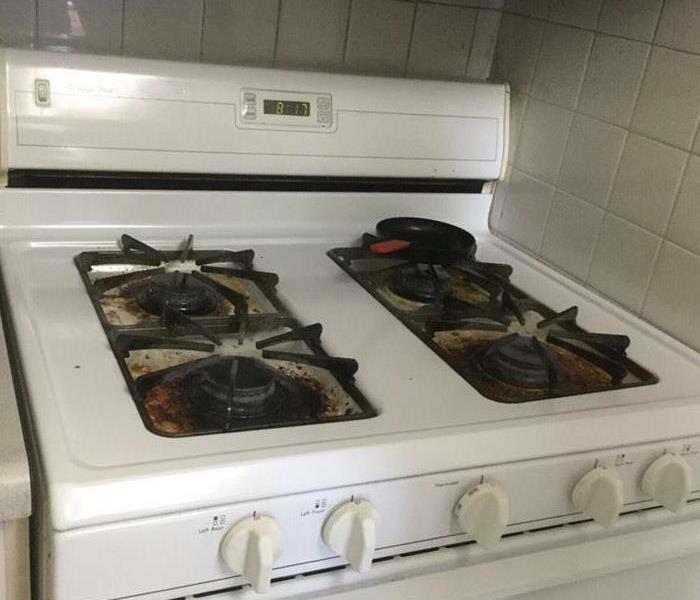 Call SERVPRO for assistance. This picture is worth 1000 words and is also why you never say never. Murphy’s Law, the minute you say, “that will never happen to us”, Mother Nature will strike with vengeance! A recent storm with winds topping 50 miles an hour upended this mature tree right into a house. Luckily no one was hurt, but the damage was extensive. Once okayed for entry by the authorities, the contents needed to be packed away and moved, the structure needed to be sealed to eliminate further water infiltration, and the water within needed to be extracted and the structure dry for rebuild. Why was SERVPRO called? Because we’re the best! We entered the home, inventoried and boxed all goods, moved, cleaned and dried all furniture, and sealed the home so it could be cleaned and dried. Currently, the homeowners are in temporary accommodations while the construction phase takes place. SERVPRO was able to get in and get our piece of the puzzle done quickly so the rebuild could begin prior to the winter weather setting in for the season. So, if you find yourself in this kind of situation, why not give us a call. We’re professionals who know exactly what to do to get your home back together. Who Are You Going To Call...Ghost Busters....NO, SERVPRO! What constitutes a hoarder versus a collector? What is the difference between someone that is thrifty and saves “things” for future use and someone that is a hoarder? Why are some people so attached to the things they find and store in their homes, while other are minimalists, and even the thought of abundant amounts of “stuff” around the house makes them nervous? We are not sure what the answers to these questions are, but one thing is for certain; some people like a lot of stuff! Who knows why, but from time to time, it must be dealt with professionally and that this why SERVPRO is often called in to help. 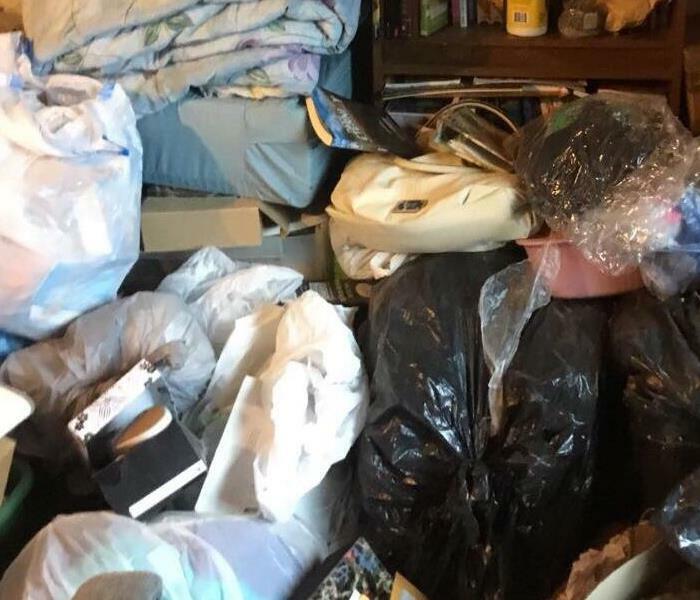 This picture denotes a home of someone the local government authorities classified as a hoarder. The situation became so acute that SERVPRO was called in to assist the local police and social services agency in the clean-up. We at SERVPRO have handled many of these jobs in the past. We are equipped with bio-hazard suits, gloves and masks, are knowledgeable about the disposal of any bio-hazard materials and are also cognizant of the fact that there may be heirlooms and valuables beneath the surface of trash. Our professional approach to these jobs is why we are called back time after time and we are pleased to provide this service. Why SERVPRO?......Because We Do It All! We recently completed a comprehensive job that entailed water remediation, extensive clean-up, mold mitigation, taking inventory and packing away household contents, and considerable rebuild construction. The job was very intense and required proper planning, scheduling of staff, ordering of building materials, and most importantly, coordination with the home owner. There was an inordinate amount of work to be done and it needed to be completed as efficiently and expeditiously as possible so that the homeowners’ family could get back to their normal routine. When we initially met with the homeowners and they walked us through their home, they asked us to get the water out and house as dry as possible, because they needed to hire someone to come in and pack up their belongings, deal with the mold, and then the reconstruction. We told them that we would certainly work as fast as possible but that they did not have to hire others, SERVPRO could do all the tasks that they were needing. Why go to an array of contractors when SERVPRO can handle all that’s required? They were thrilled that the “complete repair” of their home could be done by SERVPRO and that they could turn their focus back to their kids and get settled in temporary housing. SERVPRO was able to complete the job a few days earlier than the agreed upon timeline. The homeowners were amazed at the restoration and extremely thankful. They have told us that they are now clients for life, and although they hope not to be calling anytime soon, they will not call anyone but SERVPRO in the future. Why Do It Yourself When SERVPRO Is There to Help! Why do it yourself when you have SERVPRO at your fingertips! Simply call or go on-line and ask for our assistance. With rainy season upon us and the cold winter months ahead, let us dry you out from any water, storm or moisture issues you may experience. 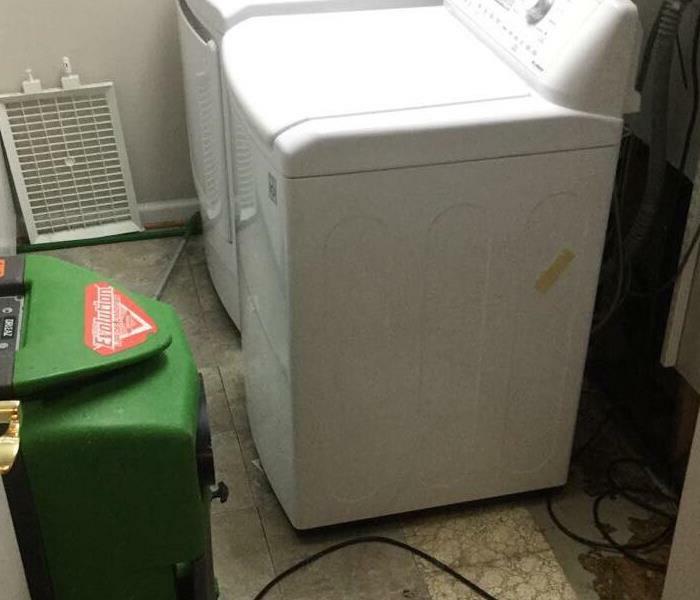 This picture denotes SERVPRO of Fair Oaks-Chantilly-Centreville drying out a customer’s home after a washing machine malfunction. Did you know washing machines have water fill-top sensors? If not, you are not alone. Most homeowners don’t know that washing machines have a sensor that knows to cut the water flow off when it reaches a specified level in the wash basin. If this sensor malfunctions or breaks, the water continues to fill the tank, resulting in overflowing that does not stop until someone turns off the washer. A malfunctioning water sensor thinks the water hasn’t reached the correct level and will continue to fill and fill and fill. So, helpful hint, do not ever leave your washer on while you are not in the house, unless you want to take the chance of coming home to the possibility of several feet of water on your floors! Should you experience a water related emergency, call SERVPRO of Fair Oaks-Chantilly-Centreville for immediate assistance. We can be reached 24/7 on (703) 830-5800. 3/6/2019 - Don't let something little turn into something huge! 1/23/2019 - Don't Hide.....Call SERVPRO! 11/20/2018 - Who Are You Going To Call...Ghost Busters....NO, SERVPRO! 11/19/2018 - Why SERVPRO?......Because We Do It All! 11/9/2018 - Why Do It Yourself When SERVPRO Is There to Help!